Is There any Treatment for a Herniated Disc on a Lumbar Lordosis? Unfortunately, some people find that their curve arches too far inwards. This is known as lordosis and can place superfluous pressure on the spine. Lordosis can occur in both the lower back and neck. However, it is most commonly experienced in the lower back, also known as the lumbar. The principle effect of lumbar lordosis is chronic discomfort and lower back pain as a result of the excess pressure on the spine. This additional strain can also cause the discs in the spine to degenerate more quickly than usual. In some severe cases of lumbar lordosis, the mobility of the patient may also be affected. 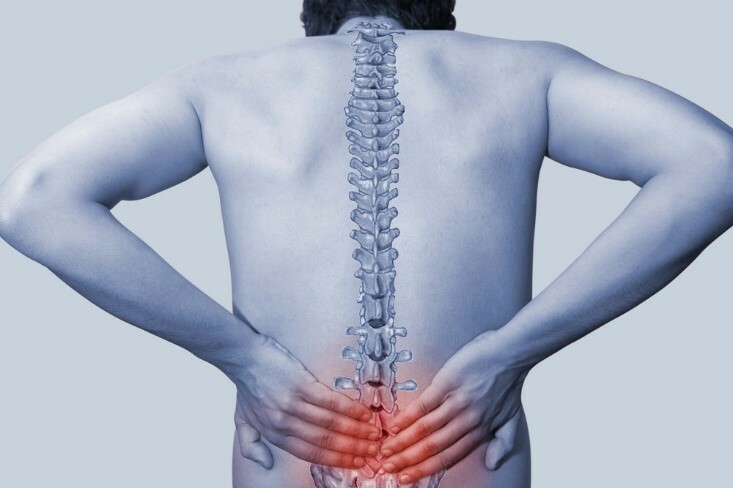 Our spine is usually made up of 33 vertebrae, between each of which is a single intervertebral disc. These discs are small, round and comprise of a tough, outer ring of fibrous bands and a soft inner gel. The purpose of intervertebral discs is to help the spine absorb impacts, and to bend and flex so that we have full range of movement. A herniated disc occurs when some of the soft, inner gel manages to push through a crack or tear in the tougher, fibrous layer. When this happens, it can cause pain and weakness in the patient’s arms or legs. In most cases, a herniated disc is caused by natural wear and tear. This is more commonly known as disc degeneration. However, you are more likely to experience a herniated disc if you are overweight or do a physically demanding job that places excess strain on your back. Some people are genetically more likely to develop a herniated disc, while others may experience an accident or injury that can cause the disc to rupture. What does a herniated disc mean for a patient with lumbar lordosis? Is treatment possible? If you suffer from lumbar lordosis and experience a herniated disc, there are things that you can do that may be able to help alleviate your symptoms. Chiropractic care provided by a qualified and trained professional can help to reduce the discomfort and reduced mobility associated with lumbar lordosis. Your physician can prescribe you with suitable pain medications and provide manual manipulations in-office. He/she can also demonstrate physical therapy exercises you can do at home, that will help prevent further stress to the lumbar region and help improve your flexibility and strengthen your spine. However, if the above therapies are not successful in providing adequate relief, a procedure known as microdiscectomy can address the problem of a herniated disc in a patient with lumbar lordosis. A microdiscectomy is a minimally-invasive procedure that is normally performed through a very small incision in the lower back. During the surgery, the herniated portion of the disc is removed so that there is no longer any pressure on the surrounding nerves. The minimally-invasive nature of the procedure means that there is minimal disruption to surrounding nerves and tissues, and the wound is very quick to heal. If you suffer from lumbar lordosis and believe you have a herniated disc, our chiropractor will be able to help. Don’t suffer discomfort for a moment longer than you have to, call and make an appointment with us today.